Visit Shipley Do-Nuts at 12403 Westheimer (between Dairy Ashford & Kirkwood) not only for the best hot, pillowy soft Shipley Do-Nuts you’ve ever wrapped your lips around but also all varieties of fresh, warm kolaches offered 24 hours a day at our Houston donut shop. Choose from sausage, ham & cheese, jalapeno sausage & cheese, Big Earl sausage, Big Earl jalapeno sausage & cheese, and our own special savory offering at night to compliment our fresh hot beignets –spicy Italian Sausage with Provolone cheese. You can now add an egg to our regular-size kolaches or have one of our vegetarian varieties. We have plenty of options on our Houston donut shop menu. Oh, did someone say “beignets“? Yes! We have delicious New Orleans style beignets made-to-order just like Cafe Du Monde! Our guests tell us these are the best beignets any Houston donut shop has to offer. 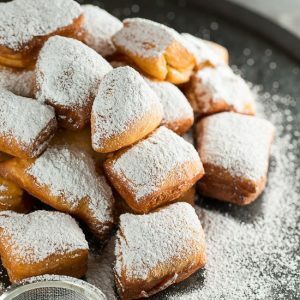 These babies are now available 24 hours a day and made hot when you order – because the only way to enjoy beignets is fresh and hot out of the fryer, covered in delicate powdered sugar while they are still hot and glistening! Shipley Do-Nuts beignets are slightly crispy on the outside and delicate and airy on the inside. Many of our loyal guests moved here from New Orleans after Hurricane Katrina. They know their beignets (pronounced benyays) and love what we are doing Shipley Do-Nuts. To complement your delicious Shipley donuts, kolaches, and beignets, or other menu items, you can also enjoy a freshly brewed cup of decaf coffee. If you want to stay stimulated a little longer tonight, order one of our coffeehouse beverages made from real espresso. You can have your choice of Café Latte, Cappuccino, Café Mocha, Espresso, Café Americano, Café Au Lait; as well as any of your favorite iced or blended coffee beverages like iced coffee, caramel or mocha frappes to cool down and amp up for another hot Houston night. Come to Shipley Do-Nuts at 12403 Westheimer (between Kirkwood & Dairy Ashford) for the freshest, hottest donuts and kolaches all day and all night — plus beignets and a unique variety of kolaches at night. Our Houston donut shop drive-thru is open 24 hours a day, 7 days a week. 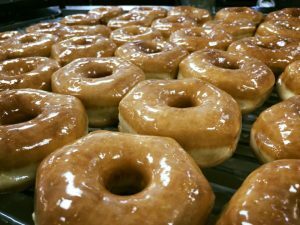 This is your 24-hour Houston donut shop. Now you can order online or from your smartphone or tablet and we’ll bring your order to your car! Remember, if you want the best beignets Houston has to offer, give us a try. If you can’t make the trip, Shipley Do-Nuts will deliver to your church, school, or office. 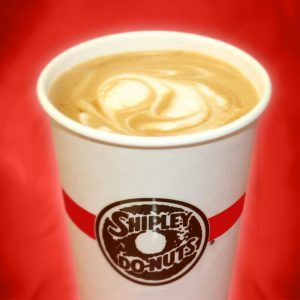 Shipley’s breakfast delivery is convenient and affordable, so order today! Looking for donut catering for your next meeting, corporate conference, wedding, or other event? Call My Shipley Do-Nuts! We offer corporate catering and event catering of our coffee, donuts, and other treats. No matter what event you’re planning, our simple, fast catering service can help you make it the best day ever.